Are there already Antiochian missions in the Philippines? Yes. How about from Russia? Yes. The Philippines are not the explicit canonical territory of anyone. This is some rather scary wording for what to me seems a commonplace event. I have been informed that a certain person whose name is Silouan Thompson came to Philippines and claims that he is an Orthodox cleric. As your Bishop and spiritual Father I wish to make known to all faithful members of the Church that the above-mentioned Silouan Thompson is not recognised by the Orthodox Metropolitanate of Hong Kong and South East Asia as a canonical Orthodox clergyman. Any priestly action that he performs is not recognised as valid. He was ordained as presbyter by a ROCOR Bishop in USA and was sent in Philippines without the Hierarchical permission of the local canonical Orthodox Bishop. This action violates the Sacred Canons. Beware of all those who come to Philippines or to other places which are under the spiritual jurisdiction of the Orthodox Metropolitanate of Hong Kong and South East Asia and try to do missionary work without the Hierarchical blessing of the Canonical Orthodox Metropolitan. Beware of those who come to you and preach and celebrate the Divine Liturgy without to have my written permission and blessing. Beware of those “who come to you in sheep’s clothing, but within are ravenous wolves” (Matthew 7:15) Their purpose is to divide the Church and the Orthodox faithful as their motives are the destructive passion of the controlling spirit and the “virus” of ethnophyletism. May the Lord Jesus Christ save you from the injuries of the adversary and keep you as a good seed for all kinds of virtues and keep you all in true faith with good works and obedience to your Canonical Bishop and to your Spiritual Mother, the One, Holy, Catholic and Apostolic Church. When did Constantinople stop recognizing Moscow as Orthodox? 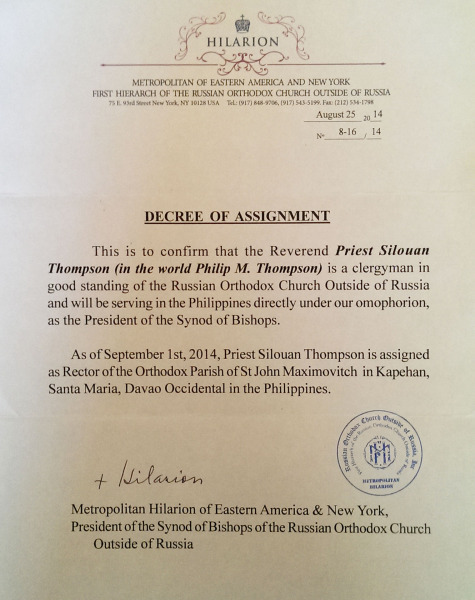 ("Silouan Thompson is not recognised by the Orthodox Metropolitanate of Hong Kong and South East Asia as a canonical Orthodox clergyman" and "He was ordained as presbyter by a ROCOR Bishop"). Violation of canons is not an automatic defrocking, after all. Kind of an inappropriate designation, given that the "pope" (EP) didn't have a direct hand in any of this. The idea that the EP has universal jurisdiction over all unclaimed territory is neo-papist. Curiously, while Met. Nektarios notes that I was ordained to the priesthood by Archbishop Kyrill, I am only claiming to be a cleric. As to my motive of "the 'virus' of ethnophyletism," I'm not sure how an American priest serving parishes made up of Filipinos and a few Australians is ethno*anything. * But I'm thankful to be of service to the growing number of Orthodox mission communities in the Philippines, with blessing of my canonical Orthodox hierarch, His Eminence Hilarion, Archbishop of Sydney, Australia and New Zealand, who assigned me here. May God grant you the strength to endure all the temptations that the evil one tries to stir up against you and the important work you're doing! Keep up the good work! Don't let religious politics get in the way of the gospel. God bless. Oh good grief! This is worse than embarrassing. It is scandalous. I am reminded of the old adage attributed to various of the Fathers that Hell is paved with the skulls of bishops.